WTH is this ? ...and Cool New Stuff Coming! Yes! The Universal Pictures Costume Department (on location in Boston) contacted my small business, Fashion Sewing Supply , for Interfacing Swatches. The tailors there loved our products...and we sold many yards to them for use in the upcoming feature film, R.I.P.D. ! Yep, that's Pro-Woven Shirt Crisp, Pro-Weft, and the Pro-Tailor line of Interfacings in those collars, plackets, waistbands, and lapels ! Production is under way on this adventure about a team of ghostly police officers who bring unwilling souls to the underworld. R.I.P.D. 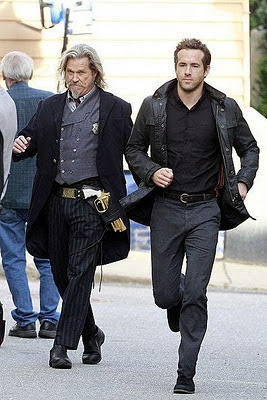 comes to theaters June 28th, 2013 and stars Ryan Reynolds, Jeff Bridges, Kevin Bacon, Stephanie Szostak, Mary-Louise Parker, Marisa Miller, James Hong, Robert Knepper. The film is directed by Robert Schwentke. I am such a geek...I am so excited! As one of my friends said, "This will be the first time I go to see a movie for the Interfacing." Talk about a great new Pam !! Super cool. Congratulations and viva l'internet ! I used your interfacing in a couple of projects. I am very impressed with the ease of application and .no bubbling.! I will be ordering more. Congratulations -- how exciting and fun! It won't surprise me a bit if you're listed in the movie credits. Thanks for sharing your good news with us! Seriously, I LOVE my job! I hope you're on the movie credits! Congrats! I tested the crisp shirt interfacing, it's fantastic !!! Wow, and now even I am only two degrees away from Kevin Bacon. Congrats, this is so cool. You know those are UNUSUALLY well fitting and attractive garments those guys are wearing. It must be the interfacing! We can all say we knew you when! Congrats! I hope even more good comes your way! I'm SO excited for you! I've worked on movies, and there is no greater venue to actually SEE the work that is put into a costume. EVERYTHING shows. So, to have your products chosen is praise indeed! To bad you can't get a credit! Congratulations! How cool is that!!! A celebrity interfacing queen right in my own backyard! Hmm, I wonder how the studios found out about your products? That's not the only show using your stuff. Congratulations and more success to follow. That's great! Hope they didn't ask for a discount! Movie people are notoriously slow to pay for things!